Leisure Facilities at Waterton Park Hotel and Walton Hall01924 257911work Swimming IndoorBuilt at lake level enjoy a relaxing swim in our 12m x 10m looking out onto the 26 acre lake and surrounding countryside. The pool is uniquely heated by the warmth of the surrounding lake using an innovative and eco-friendly water sourced heat pump. Take away the stresses of the day by relaxing and unwinding in our sauna or seperate eucalyptus scented steam room. State of the art techno gym, 14 pieces of equipment including: cross trainers, tread mills, upright bike, recline bike, leg press, chest press, rowers, lat pull down and erculina. Our leisure team can work out fitness programmes and help you with your work out. 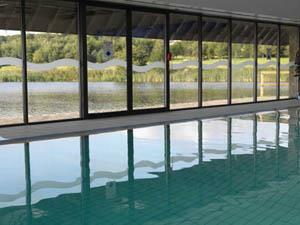 Built at lake level enjoy a relaxing swim in our 12m x 10m looking out onto the 26 acre lake and surrounding countryside. The pool is uniquely heated by the warmth of the surrounding lake using an innovative and eco-friendly water sourced heat pump.